Old wounds break open. Deep, encrusted wrongs are suddenly visible. The streets flow with anger and solidarity. The past and the future meet. The news is All Trump, All the Time, but what’s really happening is only minimally about Donald Trump, even though his outrageous actions and bizarre alliances are the trigger. The context in which most Trumpnews is delivered is miniscule: more or less beginning and ending with the man himself — his campaign, his businesses, his appointees, his ego, his endless scandals (“what did he know and when did he know it?”) — which maintains the news at the level of entertainment, and surrounds it with the fantasy context of a United States that used to be an open, fair and peace-loving democracy, respectful of all humanity. In other words, Trump is the problem, and if he goes away, we can get back to what we used to be. In point of fact, however, the United States has always been an empire, a national entity certain of its enemies — both internal and external — and focused on conquest and exploitation. Yes, it’s been more than that as well. But the time has come to face the totality of who we are and reach for real change. I believe this is what we are seeing in the streets right now. Americans — indeed, people across the planet — are ceasing to be spectators in the creation of the future. The protests we’re witnessing aren’t so much anti-Trump as pro-humanity and pro-Planet Earth. They present a partial list of “duly elected leaders the United States has had removed, disappeared and/or killed to make way for authoritarian pro-corporate regimes.” These leaders include: Patrice Lumumba of the Congo; Salvador Allende of Chile; Jean-Bertrand Aristide of Haiti; Mohammad Mossadegh of Iran; Jacobo Arbenz of Guatemala and many, many more. Their removals, and the installation of U.S.-friendly dictators, were accompanied by social chaos and mass killings. Also included on the list were such names as Tecumseh, Sitting Bull, Chief Joseph — a few of the innumerable indigenous leaders who stood in the way of Europeans’ conquest of the Western Hemisphere, the mentioning of which opens a chasm of largely unexamined and whitewashed America history. Tens of millions of people died and numerous cultures were mocked and destroyed in his American holocaust spanning centuries. This is part of our history and it can’t be diminished and written off any more than slavery can be written off. In our failure to face such history honestly, we remain trapped in collective unawareness — and thus trapped, we repeat history again and again and again. This, so it seems to me, is the psychological and spiritual foundation of militarism and the military-industrial complex, which, among much else, has bequeathed Planet Earth with enough nuclear weapons to wipe out all existing life. Donald Trump, whose vision of American greatness is all about military triumph, commands some 4,000 of them. This is terrifying, but not simply because Trump is untrustworthy and impulsive. It’s terrifying that we’ve created a world in which anyone commands that kind of power and that alone is a reason why the time for profound, deeply structural social change, is now. And I don’t believe change will come from elected or appointed leaders, who, as they settle into office, have to make their peace with the current situation, a.k.a., the deep state, with its unquestioned militarism. This is the status quo Trump both represents and lays grotesquely exposed for what it is, like no other president in memory. In other words, I don’t think we’ll ever vote real change into place. The social infrastructure won’t be seriously altered by those who are empowered by it, as Barack Obama, who was elected to be the bringer of hope and change, demonstrated during his tenure in office, in which he continued the Bush-Cheney wars. Serious change will only emerge from an external force able to stand up to the existing momentum of government and the special interests attached to it. 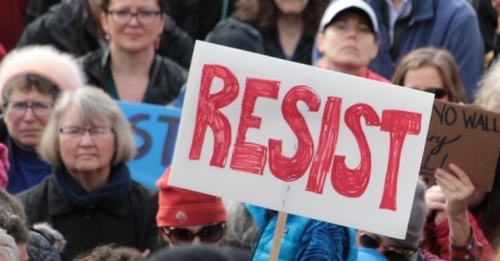 The multifaceted resistance we see on the streets — the great American awakening — may be that force. With Trump as the official voice of the status quo, more people than ever before are becoming aware that “the way things are” can be challenged and changed. The moment is here. Social policy should not dehumanize anyone. Sadly, I can find absolutely nothing in this article to disagree with. However, the thing I find most scarey about the current situation is while we have in the past deposed rulers of other countrys, with the Bannons and the Sessions and the Tillersons and similar people, the government is manenuring to be a position to make war on our own people and deny, on the home front, everything that our nation has said it stood for. It was awful of course what we have done in other countries, but we seemed to be moving to living into our promise as a country....at least domestically, but now all that has been scattered, or is in the way to being. Obama was the high point of that, more people had a chance at equality and fair treatment with some of his policies, but now trump is going about the business of ltaking us back in the opposite direction. Ironically he got elected on the premise of helping ALL the people....and yet looking at his advisors all you have are billionaires out for all the money they can get. Tillerson is the tool of Big Oil or I am really confused. So yes, the protests are about a lot of things, but one of them is the wrong man being in the White House...a man who will damage. But also to try to heal some of the wounds that have yet to be healed even BEFORE trump came along to take us in the exact wrong direction. Remember, he has said that he did not want the job, might walk away from it if elected and offered to put Vice-Presidential candidates in charge of both domestic and foreign policy. The vacuum caused by his lack of interest in running the country (rather than his business) from the Oval Office was what Bannon walked into. That may be, but sadly it doesn't make the situation any less scarey. This user has restricted commenting to friends only.